This is a theory about cubone and kangaskan. I believe that cubone is a kangaskans baby. Kangaskan is a very fragile pokemon that dies easily in the pokemon world.The baby kangaskan takes its mothers skull and wears it. In Pokemon Red/Blue the ghost of a marowak haunts lavender tower.That could be related to kangaskan. If you still don't believe me look at this. You should have just posted the 4chan theory in itself it makes more sense - rather than typing it out in your own words. Mostly everyone knows this theory regardless. 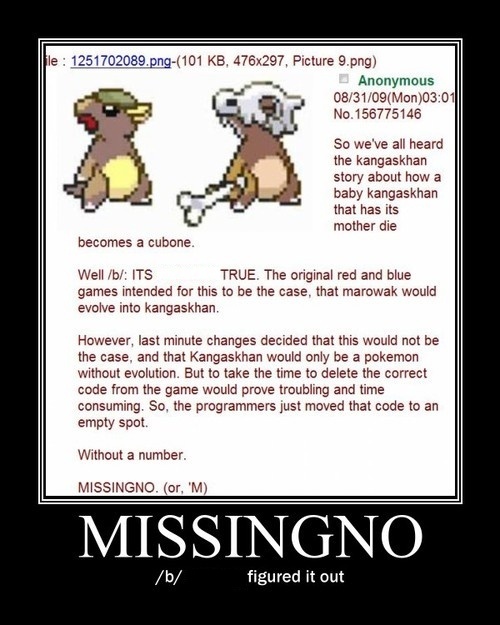 The baby kangaskhan is actually the missingno found in pokemon red/blue hence why it evolves into kangaskhan. Old news is old. is cubne like make of dirt, though. considering kangaskhan is normal, how could it have a dirt baby? what is it then? If it is weak to grass, what is it? okay, you are not telling me metagross is not made of steel! that's not necessarily true. There's no way that ditto or bronzong has a brain. I mean, Bronzong's A BELL! If you think about the theory kinda makes sence. The Marowak found in Lavender town is cubone's dead mother's ghost. Kangaskgan resembles a kangaroo. Even though both rely on their mother for protection doesn't mean it is a kangaskgan with a skull. The is no valid source that this topic is true. The anime, pokedex entries, or even the site have no information that they are the same. Cubone lives in the mountains and Kangasgan lives in the fields. There is no way they would meet. A baby Kangaskgan will grow up into a normal one and have a baby too. While as the Marowak species are different. Through pokedex entries, Marowak is just a stronger cubone and it is emotionally stronger. Kangaskgan live longer and Cubones and Marowaks don't. Sigh no one listens to me. Look here is a pretty picture!!! But doesn't that give evidence for what Boris posted? How the code was transferred to an empty spot in the game?